Nothing hurts your business more than negative online customer reviews. Your first line of defense is to get satisfied customers to talk about their positive experience. But encouraging customers to leave reviews can be difficult. Our application helps retail businesses turn satisfied customers into great online reviews and gives storeowners customer feedback to help grow their business. Find out how easy and effective this can be for your business. A survey conducted Fall 2016 by BrightLocal showed that 84% of people trust online reviews as much as personal recommendation. High-quality, positive reviews from your customers will improve your business’s visibility and increase the likelihood that a potential customer will visit your location. Click here for the full Google article. 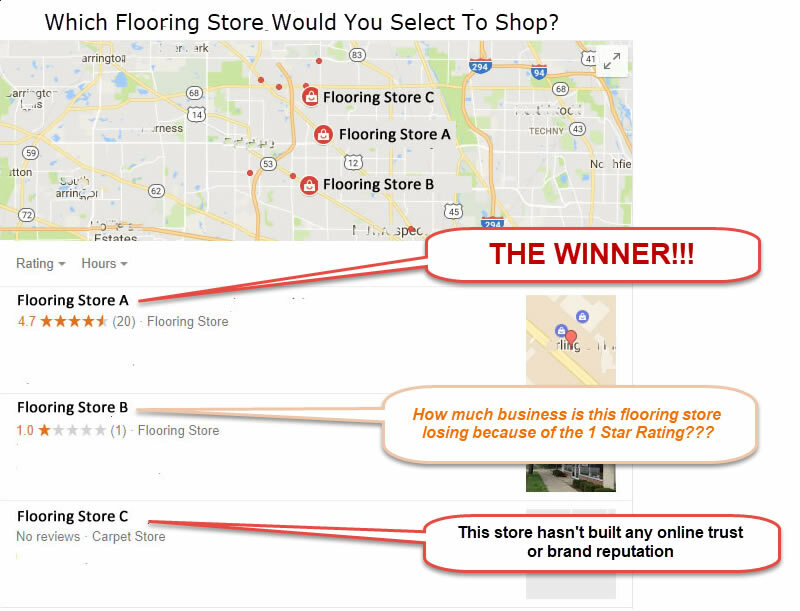 There is no doubt when shoppers see a 1 Star Rating they will avoid shopping at that business. Even no reviews is better than a 1 Star Rating. Our system helps retailers encourage their happy customers to leave great reviews that converts online shoppers into new sales leads. In today’s digitally connected world, positive customer reviews from your highly satisfied customers is critical for converting future online shoppers into new leads. At the same time, bad reviews can persuade others to not use your services OR dissuade others from using your services. Worse still, chances are you have no idea how much business you stand to lose! OR you’ve already lost!